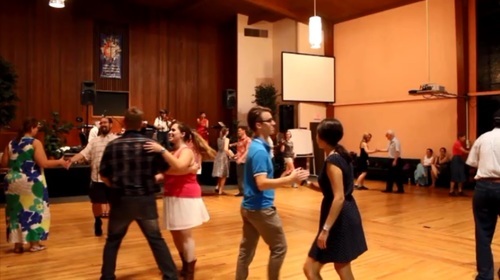 I had a lot of fun with story about barn dances being held in the local area. As with most stories, I started out with a question: Who would actually go to something like this? Turns out, a lot of people. I ended up staying way longer than I planned and had a lot of fun talking to people about why they came. With technology directing so much of how we spend our time these days, it was just really refreshing to write about something unique. For those who happened to pass by the former church on the edge of Campustown last Saturday night, the strains of live bluegrass music and sounds of hoof stomping pulsing from the sanctuary proved hard to ignore. At one point, a pair of college-aged men walked by and one nudged the other. “You going to the barn dance?” he scoffed before the two laughed and walked away. Inside, a group of about 50 people were indeed resurrecting a tradition that may seem like relic from a bygone era, but is still practiced in venues across central Iowa, by people of all ages. And in this university town, on a night when police were citing dozens of underage drinkers amid the revelry that accompanied the start of the fall semester, there were no parties quite like this one. “You’d be surprised at how many of these dances there are,” said Dan Treadway, a retired network administrator who sits on the Central Iowa Barn Dance Association’s governing board. It’s clear that you have great natural talent and a passion for storytelling. You may find value working alongside an experienced journalist or editor. Improving grammar and punctuation will benefit your work and cite you as being a professional.